Audio has a problem; it's hard to scan quickly and find what you're looking for within a body of content. The dumb solution is just to skip ahead 5 or 10 or 30 seconds. This is what Tivo does* (with video content)and it works well in that use case because your goal is to skip commercials that are standardized at 30 seconds. But you are skipping, not scanning. You lose all the data you skip entirely. That's great with commercials, but if you're trying to find a particular section within a show it's not good. Scanning is about consuming degraded data in less time until you find what you're looking for (think about skimming when you read). Our solution is high speed playback. High speed playback of audio has been enabled on Foneshow for some time now. We played back the audio at 1.2 times normal speed and then pitch shift the result down so that the speaker doesn't sound like a chipmunk. The first version of it didn't quite live up to our expectations. It worked, but the sound quality was bad, it wasn't that high speed, and it was too hard to understand what was being said. We recently reworked the high speed playback code and the new version totally rocks. The sound quality is much better, so much so that we've sped up the audio even further (we're now at 1.333 times normal speed). 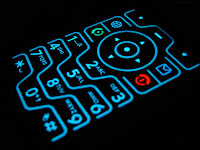 You enable high speed play by pressing the 6 key on your cell phone keypad during playback. Pressing 6 again will return playback to normal speed.